SIMFEROPOL, March 19. /TASS/. Vladimir Putin is winning 92.15% of the vote in Crimea, which held the Russian presidential election for the first time, Chairman of the regional Election Commission Mikhail Malyshev told reporters. "According to preliminary data, incumbent President Vladimir Putin garnered 92.15% of the vote, 985,117 voters cast their ballots for him. Some 2.2% voted for Pavel Grudinin, 1.81% for Vladimir Zhirinovsky and 1.64% for Ksenia Sobchak. 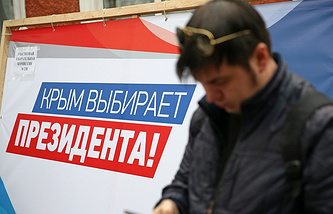 Other candidates did not clinch a single percent of the vote," Malyshev said. Almost 100% of protocols of local election commissions have been processed in the republic, he said. Some 1.069 million people cast their votes in the Crimean election or 71.47% of the overall number of eligible voters. Residents of Crimea, which rejoined Russia in 2014, cast their ballots in the Russian presidential election for the first time. Some 1,206 polling stations were opened in the republic and nearly 1.5 million people were eligible to vote.